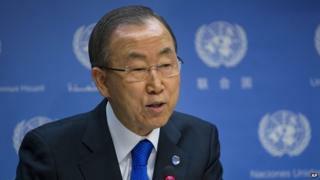 The head of the United Nations, Ban Ki Moon, says he expects a report to confirm that chemical weapons were used in attacks that killed hundreds of people in Syria last month. Tense talks between America and Russia on taking control of the Syrian government's collection of weapons go into their third day today. Both sides had different views on how to respond to that attack, but the US secretary of State John Kerry says the talks have been constructive. The US had threatened military action against the Syrian president's regime, accusing the military of killing more than 1,400 people. But Barack Obama called off a vote on the strikes with his government after Russia announced a plan to place Syria's chemical weapons under international control and have them destroyed. Syria has agreed to the plan and has sent documents to the UN to sign up to the Chemical Weapons Convention, which outlaws the production and use of the weapons. Find out more about what's happening in Syria.